During the course of research into Welsh craft cider I have spoken with many cider-makers at all scales of the craft cider industry in Wales. These range from smallholders with a handful of apple trees to some of Wales’ biggest cider-makers. One of the key themes to emerge from our discussions is the role of the family in cider-making. In the past, the cider made on the farm would have benefitted from the usual farm labour—which of course involved the family as well as workers, and these days the labour that goes towards the production of craft cider is still mainly drafted from the family. 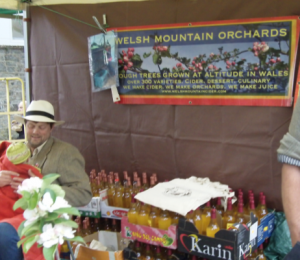 Ralph’s cider is a family business, Ralph and his son James can be regularly seen demonstrating historic cider-making equipment at food fairs and festivals. Nikki and Kevin Sweet of Toloja Orchard’s told me that their award-winning Drunk Dewi cider was originally a blend made by their son Tom Sweet. Dr Mike Penney of Troggi Cider relies on the help of his son and his friends to get the pressing done. The smallest producer I spoke to, the Hayes family from Lampeter regard their cider making as a full-on family project, as children and grand-children are enlisted to wash bottles and bring fruit to the mill. Very few craft cider makers can regard cider-making as their only job, and the story of Welsh craft cider-making is also a story about co-opting and rewarding the informal labour of a wider kin network. Because craft cider-making has to fit in around other jobs it must be seen as part of a wider economy. Perhaps this is why craft cider-makers distinguish between their cider and “commercial cider” even when the craft cider is available to buy commercially.